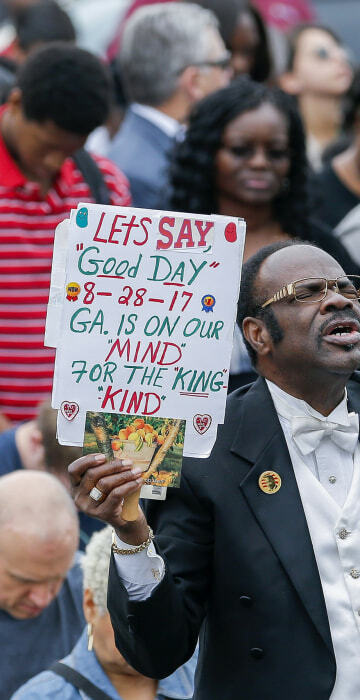 King's statue was erected in his hometown Monday at a time when monuments honoring Civil War Confederates are coming down in the South. 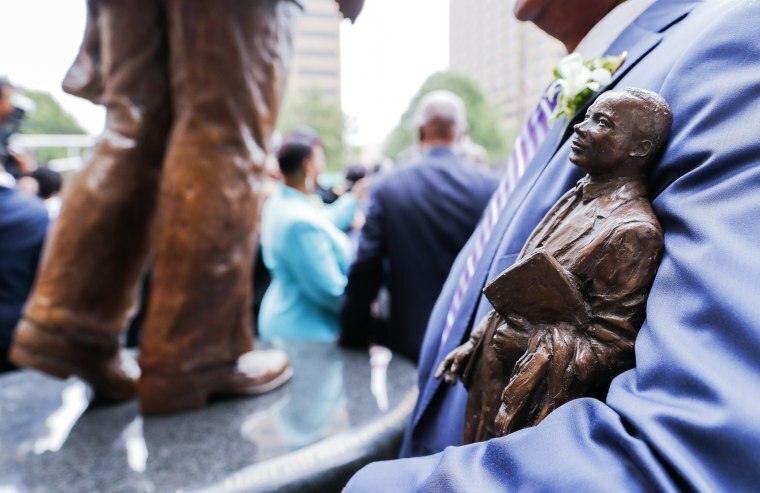 A statue paying tribute to civil rights leader Martin Luther King Jr. is unveiled on the state Capitol grounds in Atlanta on Aug. 28, 2017. 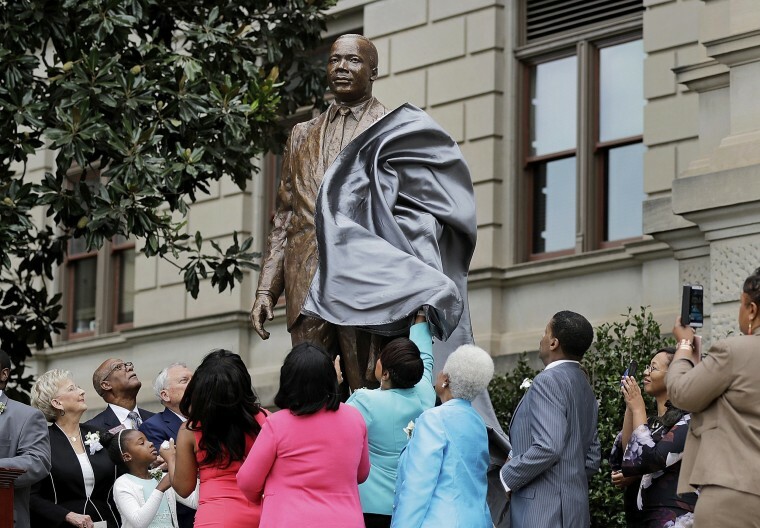 The statue's unveiling Monday came more than three years after Georgia lawmakers endorsed the project. The 8-foot (2.44-meter) bronze statue was unveiled on the 54th anniversary of King's "I have a dream" speech at the march on Washington. 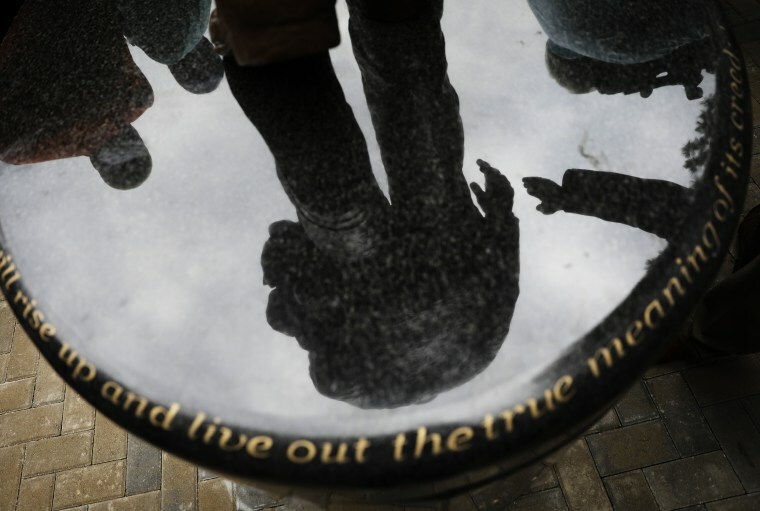 A woman touches the bronze shoes of Martin Luther King Jr. statue during the unveiling ceremony. Other statues on the Capitol grounds include Confederate Gen. John B. Gordon and segregationists Sen. Richard Russell and Gov. Eugene Talmadge. State Sen. Emanuel Jones holds his replica statue during the unveiling. A man reacts during the unveiling ceremony where the statue paying tribute to King made its public debut in front of around 800 people. 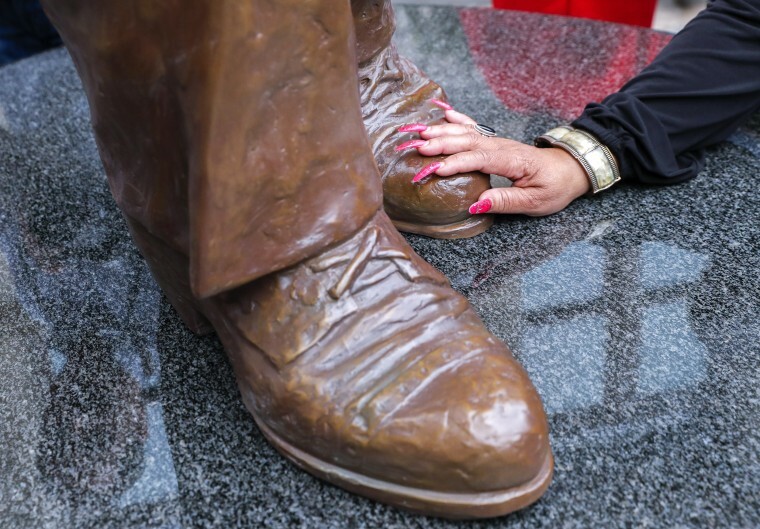 A person reaches to touch the hand of the statue. Bringing King's statue into reality took multiple struggles. Officials had to negotiate with King's family for the right to use his image. Then an artist was selected for the project, only to be killed in a motorcycle accident. After a lengthy screening, sculptor Martin Dawe was chosen to replace him. The Rev. Bernice King, right, daughter of the Rev. Martin Luther King Jr., stands under a statue paying tribute to her father. 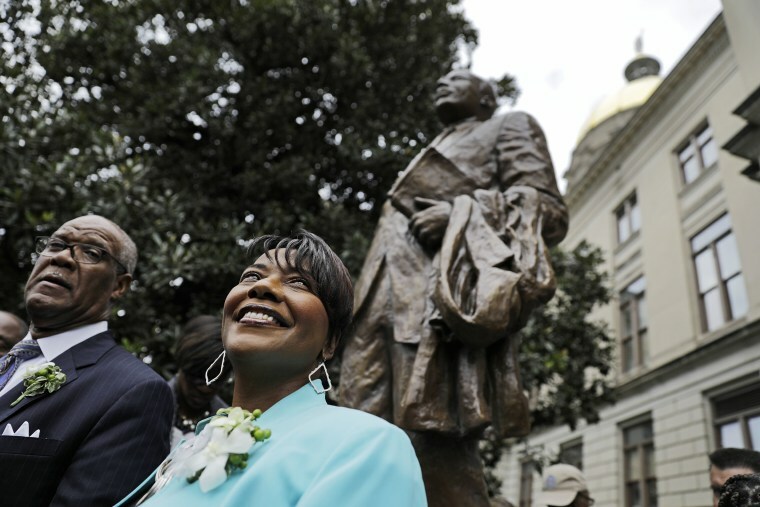 Bernice King said she hopes the erection of her father's statue can now spark conversations about the impact of monuments in public spaces. "This statue being unveiled today, I believe, also provides a sense of hope to a nation that is in turmoil once again, as many people around this nation are removing and taking down Confederate monuments," she said. 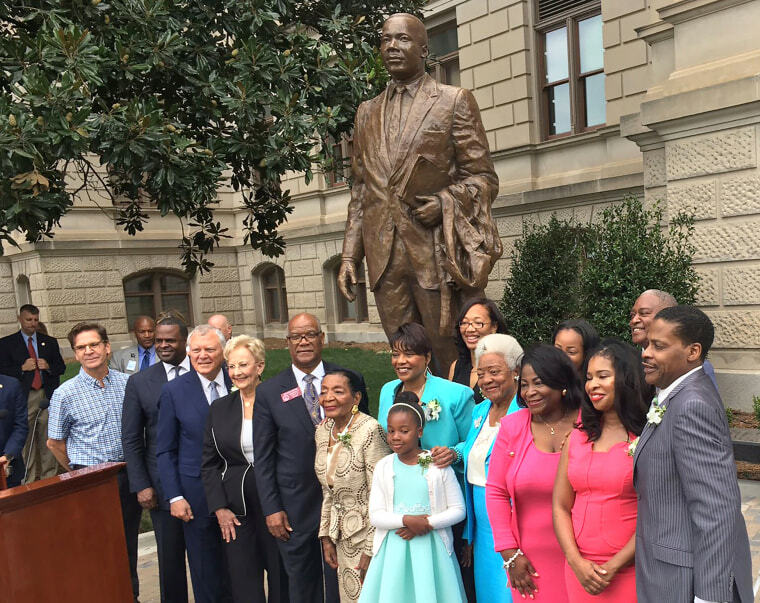 Members of Martin Luther King Jr.'s family and Georgia elected leaders stand in front of the statue. Democratic state Rep. Calvin Smyre, who sponsored the bill to place the statue of King on Capitol grounds, believes the statue will be "inspiring and give hope to generations to come." 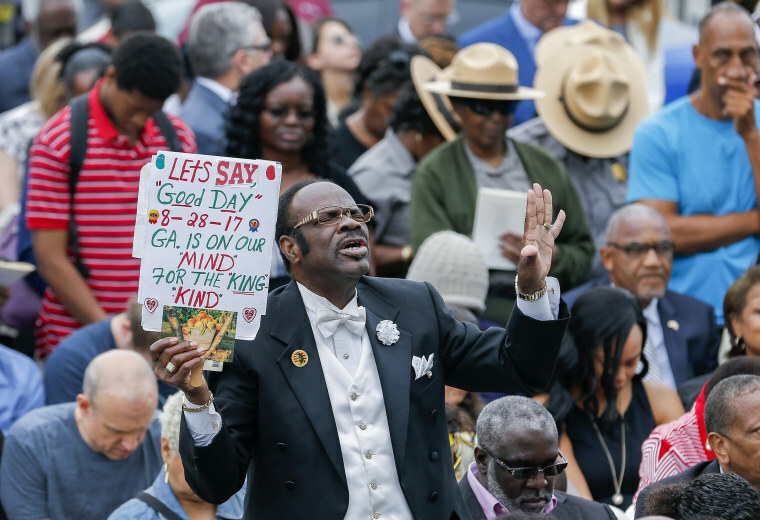 "This tribute is important and a lasting statement about the value of inclusion, the strength of our diversity and the power of grace and how it changes hearts," Atlanta Mayor Kasim Reed said. "This statue comes at a time when there are many conversations about historical monuments going on nationally and within the state. When the time comes, I'm confident in the city of Atlanta that we will walk it together as we have again, again and again." 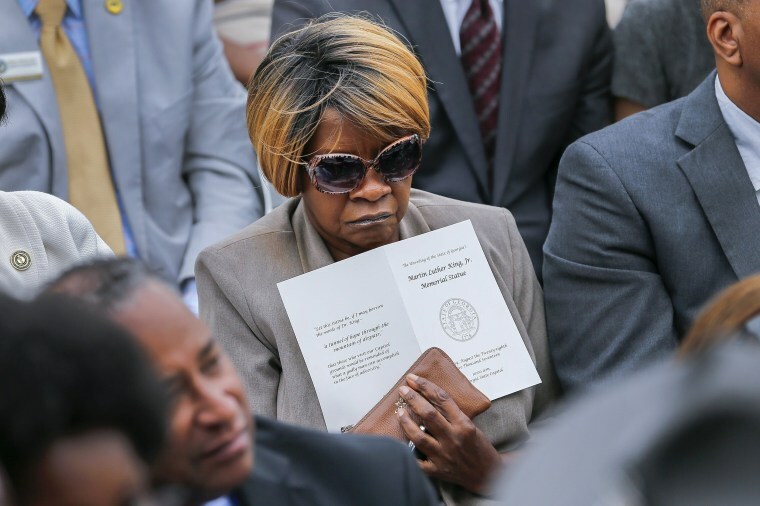 A woman holds a program during the ceremony. 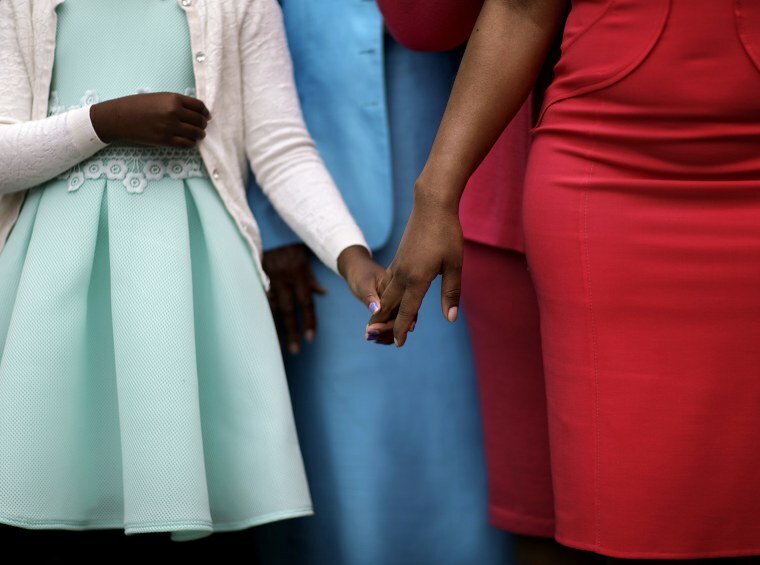 Yolanda King, 9, left, the granddaughter of the Rev. Martin Luther King Jr., holds her mother Arndrea Waters King's hand.